Two Hobbits. The Kitchen. The Garden. And trouble ensues. 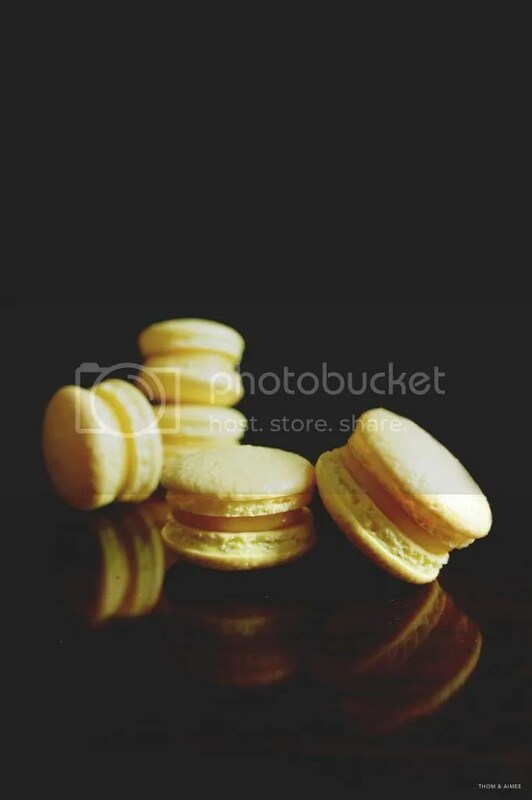 Last of the Indian musketeers (this reminds me of the excellent Bollywood film ‘3 Idiots’) is the Mango Lassi macaron. It’s probably the most familiar item for anyone not of Indian ethnicity. It was also the very first item I tried at the restaurant. So this brings back many delicious memories. Mango is featured plenty in Indian cuisine. One other mango item that I love would be in the form of a festive confectionery called the mitthai. In which, the chefs in the restaurant can make really outstanding mango-flavoured mitthais that prove to be one of the most popular item among the guests. Or the mango kulfi, a traditional Indian ice-cream moulded predominantly made with evaporated milk and moulded in small cylindrical metal cans. And of course, who can forget the King of all mangoes – the Alphonso? We did think of using the famous Alphonso mangoes since it was conveniently in season, but the fruit can command a rather exuberant price tag. Thai mangoes can do the job equally, if not brilliantly well. To emphasize the presence of the yoghurt, a dollop of the dairy product sits naked alongside the mango ganache that is spiced with a hint of cardamom. The idea was to give different layers as one bites into the macaron. To create another dimension, you could try placing a small piece of cooked mango on the yoghurt. It’s the ice cold yoghurt-y drink at one go. The project brought us a balanced amount of creativity and discipline. This being the first collection of macarons in which we created the flavours from scratch, only gave us even more satisfaction and determination. There is still room to improve, but this only cements our love of playing with contrasting ingredients. And with this Indian-inspired macaron collection, I bid my last farewell to three wonderful year of yummies, friendship and growth. And hello, new challenges. Now, that’s another journey to take. Prepare the template for macaron shells by cutting a sheet of baking parchment that fits inside a baking tray. Draw circles measuring 3.5cm in diameter and space the circles 2cm apart. To make the macaron shells, sift together the icing sugar, ground almonds and marsala. Stir the food colouring into the first portion of egg whites. Pour them into the mixture of icing sugar and ground almonds. Do not stir. Place sugar and water to a large saucepan under low heat. Dissolve sugar before bringing it to a boil over medium heat at 118C. Do not stir the sugar mixture when it starts bubbling as it will create sugar crystals. Have a pastry brush with a bowl of cold water at hand. When the sugar boils, clean the sides of the saucepan with the damp brush. While sugar is bubbling, simultaneously start whisking the second portion of egg whites to soft peaks. When the sugar reaches 118C, take the saucepan off the heat and pour the hot sugar in a thin stream over the egg whites. Whisk egg whites at high speed for 1 minute before reducing to medium speed. Continue to whisk for 2 minutes then allow meringue to rest until it cools down to 50C. Tip meringue into the mixture of icing sugar and ground almonds. Fold the batter and stir outwards from the middle to the sides, rotating the bowl as you stir. Continue stirring until the batter is just starting to turn glossy, like slightly runny cake dough. Scoop a little batter and scrape into a piping bag, fitted with a plain nozzle. Fill the bag with half of the batter by scraping it on the side of the bag. Squeeze batter into piping bag so it ends up to the end of the piping bag, to prevent any space or air bubbles in the batter. Twist the end of the piping bag several times and start to pipe the batter out. Lay the macaron template on the baking tray and cover it with a sheet of baking parchment. Hold the piping bag vertically, about 2 cm above the baking tray. Squeeze the top to pipe out the first shell. The shell should be smaller than the template circle, just short of 3.5cm in diameter as the batter will spread during baking. Continue to pipe the shells out onto other baking trays with the template until all the batter is piped out. Flatter the points that have formed on the shells by rapping the baking tray on a work surface with a moist kitchen towel. Allow the shells to stand at room temperature (or in an air-conditioned room) for about 30 minutes until a skin forms on the surface. To test when it’s ready, gently touch the shell; the batter should not stick to your finger. Pre-heat oven to 180C and bake the shells for 12 minutes. Open the oven door after eight minutes and after 10 minutes, to let out steam. 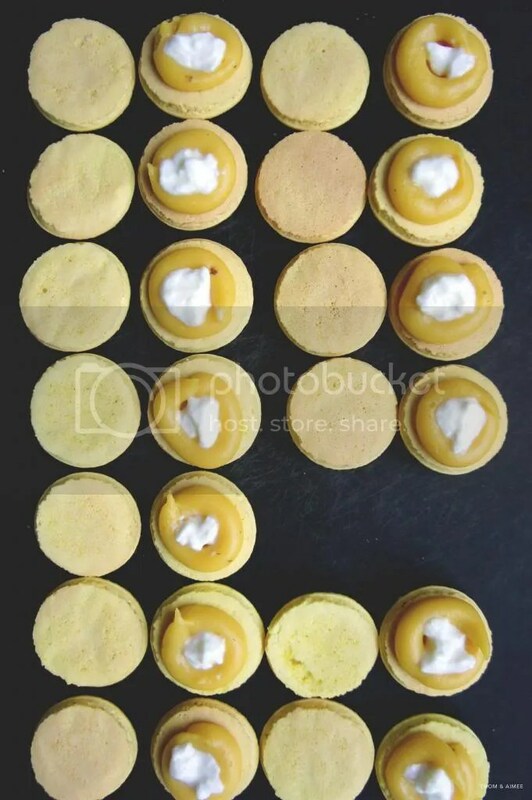 Once baked, slide the macaron shells out of the baking tray and onto the work surface to prevent the shells from baking further on the baking tray. Allow the macarons to cool on the baking parchment as taking them off when it’s warm will tear the bottom. When cooled, carefully unstick the shells from the baking parchment. They are now ready to be filled. You can store them for 48 hours in the refrigerator or freeze them. Preheat oven to 100C and place mango cubes in. Bake for 1 hour and 30 minutes, to reduce the moisture of the mango. Then blend mango into a puree. If the mango puree still seems moist, then cook in a saucepan in low heat until there is lesser moisture. Chop up the chocolate and melt it in a bowl over a pan of barely simmering water. Pour mango puree over melted chocolate a third at a time. Then add the cardamom and butter, and whisk to achieve a smooth ganache. Transfer the ganache to a gratin dish, press clingfilm over the surface of the ganache. Place it in the refrigerator to allow ganache to thicken. Spoon the cooled ganache into a piping bag fitted with a plain nozzle. Pipe the mango ganache around the edge of one macaron shell . Then spoon some set yoghurt into the middle of the mango ganache then top with an empty macaron shell. 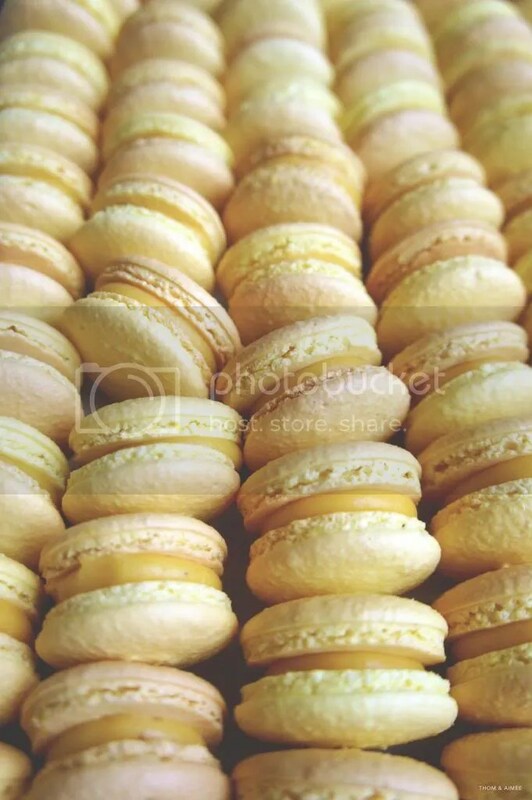 Store the macarons in the refrigerator for 24 hours before serving. As you add the mango puree to the melted chocolate, you’ll experience the mixture separating, as if it is curdled. Do not worry; this is caused by molecules of fat in the cream and chocolate separating. Continue to mix energetically, drawing small circles to create an elastic, shiny “kernel”; work your way out to the sides of the bowl in widening circles. I find placing the bowl on a bain-marie that has barely simmering water for 3 to 5 seconds helps to incorporate it. Pressing clingfilm over the surface of the ganache ensures that no condensation will find its way to the chocolate. Swoon. Nothing else needs to be said.